This essential clinical reference in the specialty of wound care is the go-to guide for Registered Nurses, Physical Therapists, Physicians, Podiatrists, Long Term Care professionals and others shouldering the responsibility of finding effective solutions in treating both common and atypical wound problems. Written by renowned wound care experts Sharon Baranoski and Elizabeth Ayello, in collaboration with an interdisciplinary team of experts, this handbook covers all aspects of wound assessment, treatment, and care. It also covers topics that other text-references do not, including sickle cell wounds, atypical wounds, and an entire chapter devoted to special populations. The book is divided into two parts. The first is Wound Care Concepts, which provides in-depth information on need-to-know topics, including assessment, wound healing, treatment options, pain management, and much more. The second section, Wound Classification and Management Strategies, covers the various types of wounds – including wounds such as pressure ulcers, arterial ulcers, diabetic foot ulcers, surgical wounds, and many others – and provides the strategies for their successful care. A chapter devoted to special populations, including the intensive care, spinal cord injury, and HIV/AIDS populations. When it comes to providing the best care for patients, Wound Care Essentials is the gold standard. 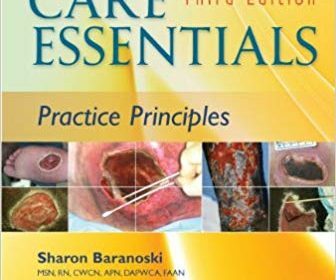 All health care professionals will benefit from the wealth of information, up-to-date techniques and best practices Baranoski and Ayello provide for the very important, complex responsibility of wound care.